With the inclusion of one of our inflatable bouncy castles or games, your party will be the talk of the town long after the guests leave. Now available at MJ Castles is the highly requested and recommended Inflatable Dart Game! 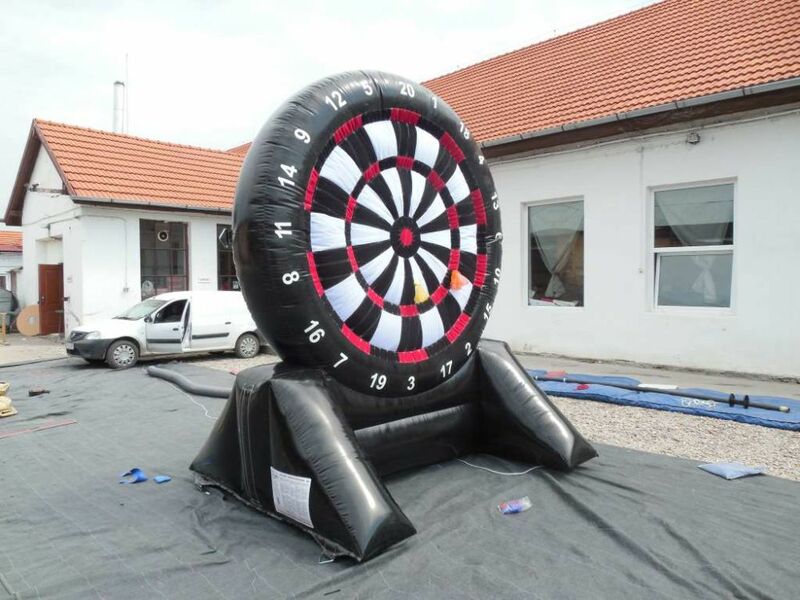 Enjoy throwing the velcro darts at the over 11-foot high (3.4m) huge target when hiring this inflatable. Suitable for children ages 3 and up, the whole family can participate in the festivities. Either work in teams or go head to head with friends while you compete to see who can get the most points! Bring something new and original to your next get together with the addition of the Inflatable Dart Game and entertain your guests for endless hours. Whether it's for a birthday, reception, business retreat, or wedding, this game will be the perfect extension to any event. Why Should I Hire a Dart Game? A good question that many might ask is: why should I hire an inflatable dart game? Sure it's fun for a little while, but won't my guests get bored from playing the same game for hours? No! With a giant dartboard, you have many different games right in your hands. There is traditional darts, 101, around the clock, bullseye, 21, and much more! The ability to play so many games with one inflatable guarantees your friends and family hours of boredom-free entertainment! You can, also, offer prizes or play for bragging rights. There's nothing you can't do with this dart game to create memories that will last a lifetime. The only thing that is required from you to hire this Inflatable Dart game is a 12 feet wide by 20 feet length space for the target, as well as room for throwing the darts. It requires electricity from a standard power socket within the location of the game for the target to remain inflated, so an extension cord may be necessary, depending on where you want the game to go. The rest is on us. With a hiring price of just £59, you can have this game for your next event. The ability to use it indoor and outdoor makes it extremely versatile and easy to find the required space for the game. We handle the delivery, setup, take down, and pick up of the Inflatable Dart game so that all you have to worry about is what kind of snacks to offer your guests! We ensure the safety of the game so your whole family can participate in the fun. Just remember to only use the velcro darts that come with the game or the fun ends sooner than you want! We are always more than happy to answer any questions or concerns that you may have. We look forward to seeing you at your next event!